Swains Island is an atoll in the Tokelau chain, the most northwesterly island administered by American Samoa. Although culturally belonging to Tokelau, politically, it is a territory of United States of America. It has variously been known as Olosenga Island, Olohega Island, Quiros Island, Gente Hermosa Island and Jennings Island throughout its history. The current population of the island is 37, all located in the only village. The island has a land area of 1.508 km² (0.582 sq mi, or 372.55 acres). The island is unusual as the atoll is an unbroken circle of land and as such it features a lagoon closed off from the sea. The fate of such a lagoon depends on the amount of rain. No rain: it dries up; some rain: it changes into a small, strongly saltwater lake; lots of rain: it changes into a freshwater lake. The latter has happened here. Pedro Fernandes de Quiros, a Portuguese navigator sailing for Spain, is believed to be the first European explorer to have discovered the island on 2 March 1606. He named the island Isla de la Gente Hermosa, which means "island of thebeautiful people" in Spanish, on 1 February 1841. Later, there was an expedition from Fakaofo to the island. The male inhabitants of the island either fled or were killed by the invaders, while the women were taken with the invaders to Fakaofo. The infertility of the island is attributed to a curse the chief places on it. The American captain Henry Hudson of the Peacock visited the island in 1841 but was unable to land because of stormy weather. He then went to rename the island Swains Island, for the whaler who had alerted him to it. 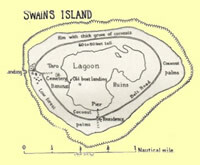 In 1856 an American, Eli Hutchinson Jennings, started a community on Swains Island. He claimed that he received the ownership title from Captain Turnbull, an explorer who had claimed rights to the island. He had recently married a Samoan, Malia. On 13 October 1856 it became a semi-independent proprietary settlement of the Jennings family. He established a coconut plantation which flourished under his son, Eli Junior. Eli Hutchinson Jennings Senior also was instrumental in helping Peruvian Blackbird slaveships depopulate the other three Tokelau atolls-see H.E. Maude's Slavers in Paradise (A.N.U., Canberra, 1981). The Resident Commissioner of the British Gilbert and Ellice Islands (then a British protectorate, since 1916 a colony, presently Kiribati) supposedly demanded an $85 tax because of the plantation's success. He paid the tax but was upset and brought the matter to the U.S. State Department and was later refunded. In 1907 it was claimed by the British Gilbert Islands colony, but in 1909 recognized by Britain as within the U.S. zone of influence. The matter of who owned the island came into question after Eli Jr.'s death in 1920 and his wife's in 1921. The United States decided to give the right of administration jointly to Eli's daughter Ann and son Alexander while making it officially part of the American Samoa by annexation on 4 March 1925. Alexander Jennings, the son of Eli Jr., became the managing owner of the island. The population at the time was around 100. In 1954 the United States demanded a local government. Since then the island has sent one non-voting member to the American Samoan territorial legislature. On 25 March 1981 New Zealand, of which Tokelau is a non-self-governing colonial territory, confirmed the U.S. sovereignty. In the draft constitution which was the subject of the Tokelau self-determination referendum, 2006, Swains Island is claimed as part of Tokelau.